The choicest and most tastefully dressed dandy in London. I saw the master — nothing could be more evident — in the light of an intense emotion, and I trembled, I remember, in every limb, while at the same time, by a blest fortune, emotion produced no luminous blur, but left him shining indeed, only shining with august particulars. It was to be remarked that those of his dress, which managed to be splendid even while remaining the general spare uniform of the diner-out, had the effect of higher refinements, of accents stronger and better placed, than we had ever in such a connection seen so much as hinted. But the offered inscrutable mask was the great thing, the extremely handsome face, the face of symmetry yet of formidable character, as I at once recognised, and which met my dumb homage with a straight inscrutability, a merciless military eye, I might have prounounced it, an automatic hardness, in fine, which at once indicated to me, and in the most interesting way in the world, a kind of economy of apprehension. Wonderful was it thus to see, and thrilling inwardly to note, that since the question was of personal values so great no faintest fraction of the whole could succeed in not counting for interest. The confrontation was but of a moment; our introduction, my companion’s and mine, once effected, by an arrest in a doorway, nothing followed, as it were, or happened (what might have happened it remained in fact impossible to conceive); but intense though the positive perception there was an immensity more left to understand — for the long aftersense, I mean; and one, or the chief, of these later things was that if our hero neither shook hands nor spoke, only meeting us by the barest act, so to say, of the trained eye, the penetration of which, to my sense, revealed again a world, there was a grim beauty, to one’s subsequently panting imagination, in that very truth of his then so knowing himself (committed to his monstrous ‘readings’ and with the force required for them ominously ebbing) on the outer edge of his once magnificent margin…” Notebooks of Henry James. His appearance in walking-dress in the streets, during his later years, was decidedly “odd,” and almost eccentric, being marked by strongly-pronounced colors, and a fashioning of the garments which had somewhat of a sporting and somewhat of a theatrical guise. 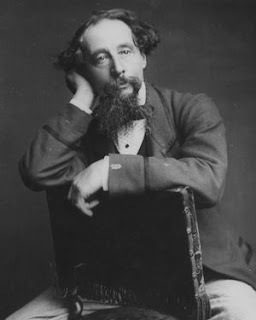 To those who did not know that he was Charles Dickens, he might have been some prosperous sea-captain home from a long voyage, some Western senator on a tour in Europe, some country gentleman of Devon or of Yorkshire. . . But those who could look far back remembered when Charles Dickens was in countenance, like Milton in his youth, “eminently beautiful, ” and when in attire, he was next to Count D’Orsay, the choicest and most tastefully dressed dandy in London. Speeches, Letters and Sayings of Charles Dickens, ed. George, Augustus Sala. Nothing like creating a post on my two favorite authors. I love the description of the outfits Dickens wore while walking the streets of London. Henry James confessed to doing the same thing in preparing the characters for The Princess Casamassima. James’s paean to Dickens is so beautiful and expressive, very similar in tone to Coleridge’s florid tribute to Byron and Baudelaire’s to Poe. The comments reveal much as much about the admirer as the object of admiration. Painting: William Powell Firth, Charles Dickens in his Study. Can you think of any dandies on Dickens’s work? Only one who comes to mind is old Mr. Turvydrop in Bleak House.